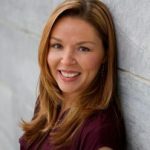 While I was deep in the final copy edits of my latest YA novel LIES THAT BIND, the Philadelphia Eagles went to the Super Bowl. Most of you probably read that and think, big deal? Is your book about football or something? No, it’s not. 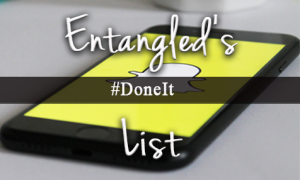 It’s a YA spy thriller, the sequel to PROOF OF LIES. But it’s significant because I live in Center City Philadelphia, and I was raised in a family of diehard Philly sport fans. As you may know, Philly isn’t known for its championships—at least not in my lifetime. 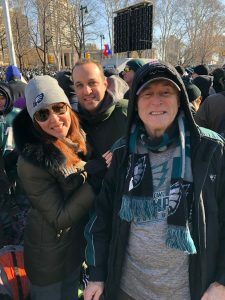 There were a couple of titles when I was a toddler, then a complete drought (or curse, if you believe the rumors regarding William Penn’s hat, http://www.philly.com/philly/business/comcast/comcast-ironworkers-billy-penn-eagles-nfl-new-tower-20171130.html) until the Phillies won the World Series in 2008. The Eagles had never won. I was raised on football. I was a cheerleader starting in the second grade. I can sing all the lyrics to “Buddy’s Watching You.” I play in two fantasy leagues—one all female, which I’ve won. I understand penalty calls—from horse collars to encroachment—and I actually watch the NFL Network while eating my cereal in the morning. Philadelphia fans are passionate. Notice I said “passionate,” and not lunatics. The media has given us a bad rap. There have been decades of discussion of us throwing snowballs at Santa (literally fifty years ago), and batteries at players, and beer cans at opposing fans. But nothing compares to the parties on Broad Street during this championship run. I was there. 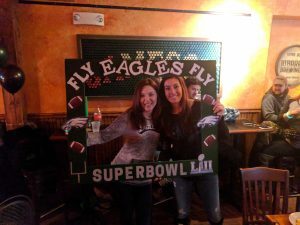 Both when the Eagles won the NFC Title to clinch their Super Bowl berth, and again after Tom Brady’s Hail Mary pass hit the dirt and the Eagles hoisted the Lombardi trophy. 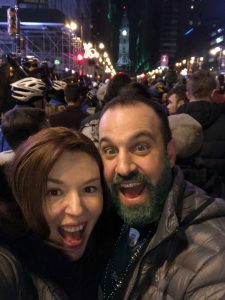 My brother, Lou, and I rented a room in a bar on South Street to watch the game with about fifty of our friends and family, and we all walked from Broad and South to Broad and Spruce Streets following the big win. I hate disappoint, but unlike reports on Howard Stern, no one actually broke into the zoo and road a ostrich down Broad St. No one lit anything on fire that I saw. In fact, the majority of the people in this very dense crowd (think Times Square on New Year’s Eve to ring in the year 2000) were simply deliriously happy. 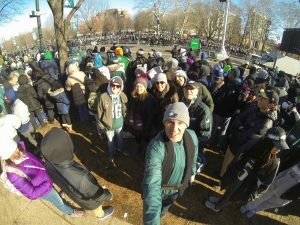 Cops were everywhere—high fiving fans as they past—and the city was publicly happy with how few “knuckleheads” there really were (both after the Super Bowl and during the parade). So here’s a photo of me with one of my best friends from childhood, Melanie, who drove nine hours straight from Cincinnati, OH to be in Philly for the game. And yes, my sister-in-law handmade that sign, which was a huge hit with strangers on Broad St. later in the night. This is my husband, Jordan, and me on Broad Street immediately after the win. And yes, he grew a beard during the playoffs (too superstitious to shave it) and dyed it green. It’s gone now. 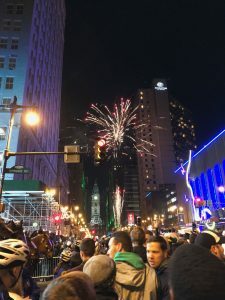 Philadelphia citizens brought their own fireworks and lit them near City Hall. 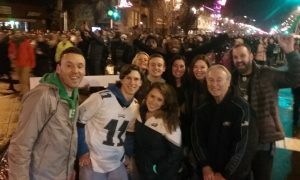 To prove I’m not exaggerating how not-dangerous the scene was, my 72-year-old father walked down Broad Street with us. Here he is with me, my husband, Melanie, my brother, my sister-in-law, and their kids. The parade was as family friendly as any I’ve ever been to, assuming your parades allow open containers of beer. Here’s the whole family waiting for the team to pass near the Art Museum steps. Along with a photo of me, my husband, and my dad. 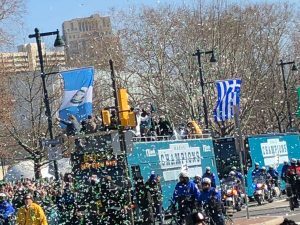 I’m throwing in a picture of the World Champion Philadelphia Eagles, just to prove these crowd shots weren’t at a Thanksgiving parade or something. 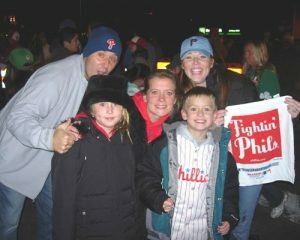 And to emphasize exactly how long this city stretches between championships, here’s a photo of my brother Lou, my sister-in-law Nicole, me and their kids celebrating the Phillies World Series win on Broad Street in 2008. 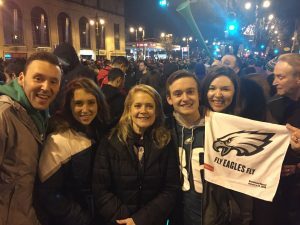 If you’ve read this far and need further proof that the majority of Philadelphians partying on Broad Street weren’t nearly as rowdy as the national media would like you to believe (Fake News! ), here’s a video of us walking down Broad Street immediately after the win near the intersection with South Street. Look at how calm and happy everyone is! Trust me, it was amazing! I’m so glad I got to do it in my lifetime! 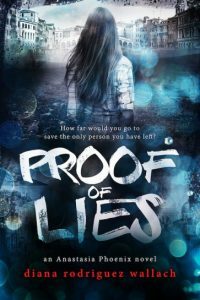 Pick up Proof of Lies by Diana Rodriguez Wallach for FREE!